The In Guardia Parade is a re-enactment that portrays an authentic event that took place regularly inside important military fortifications in Malta and Gozo. 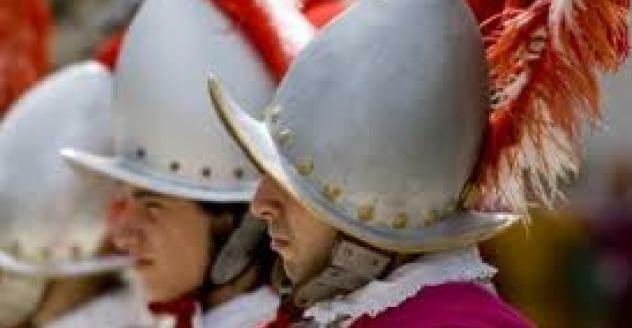 The re-enactment portrays the inspection of the St. John’s Cavalier in the town of Birgu and its garrison by the Grand Bailiff of the Order of the Knights of St. John in charge of military affairs. During the re-enactment, the soldiers and knights of the fort’s garrison – some 55 re-enactors – are kitted-out in their finest uniforms and perform a military drill demonstrating to the Grand Bailiff the garrison’s state of readiness in the event of a military threat. The show starts at 11.00 hrs. – lasts 45 minutes and will be held be held be held at St. John’s Cavalier (close to Couvre Porte), in Birgu (Vittoriosa). One may be able to visit part of the fort prior or following the re-enactment. The re-enactments are held according to schedule as above. However, in case of inclement weather or else due to some unforeseen circumstance the event may be cancelled without prior notice. When in doubt it is best to contact the Tourist Information Office at Auberge D’Italie, Merchants Street, Valletta on tel: 00356 22915440/1/2. Take a bus from Valletta Bus Terminus to reach Birgu in c. half an hour. Buses stop close by the bridge that connects the town of Birgu with the town of Bormla. The bus stop is called Café Riche. There are also buses that continues further on to Kalkara. One may take advantage of this visit to explore Birgu and its historic attractions, e.g. Inquisitors Palace, Maritime Museum, Malta at War Museum and the Couvre Porte area. One may also visit Malta’s best flea market at Fortini football ground located just outside the town. Then one could head towards the centre of the town to visit the Collachio (city core area). The Town Square and the Birgu Yacht Marina are both interesting places where to make a brief exploratory stop. To finish off the tour of Birgu, one may also sit down and relax for a coffee or snack at one of Birgu’s many restaurants.